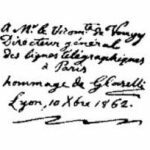 What is a Pantelegraph (Invented by Giovanni Caselli)? 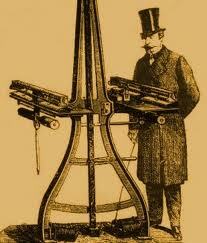 Fax Authority >> Glossary >> What is a Pantelegraph (Invented by Giovanni Caselli)? 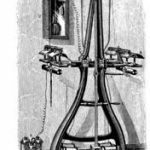 The pantelegraph was an early precursor to the fax machine for transmitting images over telegraph lines. 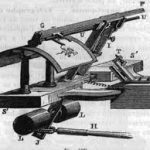 Used commercially in the 1860s, it was the first device to enter practical service and could send handwriting, signatures, and drawings up to 15 cm by 10 cm. Using a regulating clock and a pendulum to ensure that it could make and break the current for magnetizing its regulators, as well as ensuring the transmitter’s scanning stylus and the receiver’s writing stylus stayed synchronized. The receiver reproduced the image by using paper with potassium ferricyanide, which darkened when an electric current passes through it. A sheet of paper 111mm x 27m, containing 25 handwritten words, would take 108 seconds to transmit. 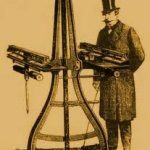 The pantelegraph was most commonly used to verify signatures used in banking transactions.